U.S. Sen. Rob Portman was the featured speaker on Tuesday during a ceremony in which Otterbein Senior Lifestyle Choices gifted a wide variety of Otterbein’s Shaker artifacts to the Warren County Historical Society for permanent display in the museum. Portman, co-author of Wisdom’s Paradise, a book on the Forgotten Shakers of Union Village with Cheryl Bauer, and whose family owns the Golden Lamb, said the Shakers’ devotion to faith and entrepreneurial spirit characterized the greatness of America. “I so appreciate this collection all under one roof, to be able to tell generations this great story,” he said. Tuesday morning was a momentous occasion, said John Zimkus, historian and lecturer for the Warren County Historical Center and the Golden Lamb. The gift of the collection celebrates quality of life, a mission equally shared by the Shakers, Otterbein Senior Lifestyle Choices and the Warren County Historical Society. Bill Duning, president of the historical society, accepted the gift on behalf of the organization from Charles Mahan, chair of the Otterbein Board of Trustees, and Jill Hreben, CEO/president of Otterbein Senior Lifestyle Choices. The gift comes during the 100th year anniversary of Otterbein, Hreben noted. Naming names, she added that behind all the history and artifacts, there have been many wonderful people who were integral to the creation of such a magnificent history. Mahan said he learned about the Shaker history through Portman’s book and he feels confident that the collection will be maintained with care and displayed with pride for the next 100 years. A more in-depth view of the pieces was given by Victoria Van Harlingen, curator of the museum. Guests also enjoyed refreshments and toured the museum. Van Harlingen said the Shakers’ demise came from the Industrial Revolution, but were themselves responsible for more than 100 inventions still used in some way today. For many years, the Warren County Historical Museum in Lebanon has been ‘home,’ albeit on loan, for much of Otterbein’s collection of Shaker furniture and other artifacts. 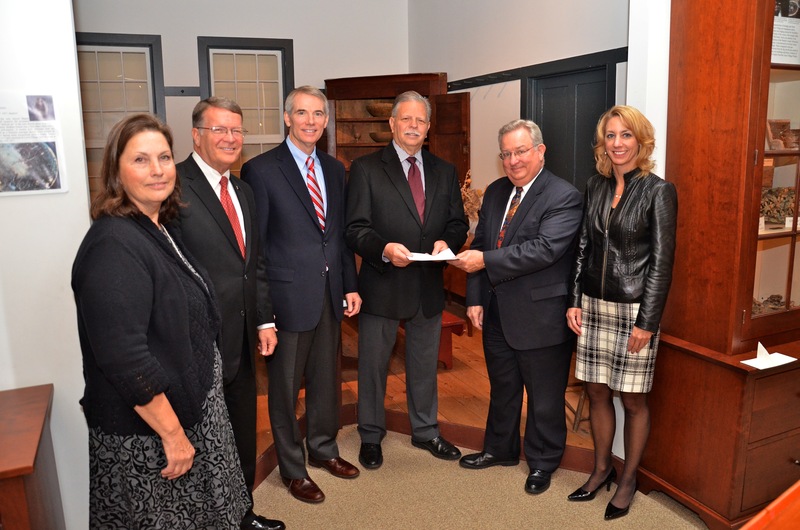 In this ceremony, Otterbein formally transferred ownership of the collection residing in the Warren County Historical Museum to the Warren County Historical Society. In return, the society has upgraded display areas and cases and will preserve all of the items transferred to them in the Warren County Historical Museum for eternity. Other aspects of the collection have been and will continue to be on display in the Otterbein Historical Museum in Marble Hall. As Otterbein begins the journey into its second century, they are reminded of the many changes that occurred during its first 100 years. But a constant has been and will always continue to be Otterbein’s recognition of the importance of its history, the historical significance of the Shaker community that preceded them on this land, and their desire to share that legacy with the local community and people throughout the country. Included in the agreement with the historical society is the plan to present educational retreats, classes, and exhibits featuring the Shaker items throughout each year, and recognize the Otterbein contribution. Further, the agreement enables Otterbein to use selected items for similar activities on the Otterbein campus. It is believed that by organizing the talent, materials and using the appropriate environment, many more members of the community will have the opportunity of learning about the Shaker movement and Otterbein’s heritage.